Hank Henshaw was an astronaut at NASA until a solar flare hit his space shuttle during an experiment in space, damaging the ship and the crew. Henshaw and the crew, including Henshaw's wife, found that their bodies had begun to mutate and, after returning to Earth, Henshaw's entire crew either perished or eventually committed suicide. After learning that Superman had thrown the Eradicator into the sun in a battle during the space shuttle experiment, Henshaw blamed Superman for the solar flare and the accident. Before his body completely disintegrated due to the radiation exposure, Henshaw was able to save his consciousness. Using NASA communications equipment, Henshaw beamed his mind into the birthing matrix which had carried Superman from Krypton to Earth as an infant. He created a small exploration craft from the birthing matrix and departed into outer space alone. Becoming increasingly mentally unstable, Henshaw used Superman's birthing matrix to create a body identical to Superman's, albeit with cybernetic parts. He returned to Earth to kill Superman, only to discover that Superman had already died during Henshaw's absence. Following Superman's eventual resurrection, Henshaw would not only become a recurring adversary of Superman but of Green Lantern as well. Hank Henshaw became a member of the Sinestro Corps during the Sinestro Corps War. Zor-El is the younger brother of Jor-El, husband of Alura, father of Supergirl, and paternal uncle of Superman. Originally, he escaped from Krypton's destruction along with the other inhabitants of Argo City. In September 2011, The New 52 rebooted DC's continuity. In this new timeline, Supergirl discovers an amnesiac Cyborg Superman living on the planet I'noxia. This turns out to be Zor-El, who was rescued from Krypton's destruction by Brainiac and reconfigured as a half-man half-machine to be his scout looking for stronger species in the universe. As Cyborg Superman, Hank Henshaw possesses the ability to control and reanimate various machines. Due to his experience with Superman's birth matrix, Henshaw now has all of Superman's powers and genetic tissue identical to the Man of Steel's. As a member of the Sinestro Corps, Henshaw has access to a power ring fueled by fear energy that allows him to create any construct he can imagine. 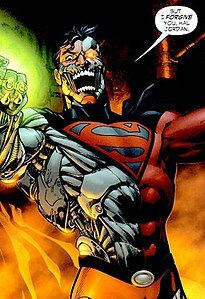 As Cyborg Superman, Zor-El is cybernetically enhanced with the ability to fly, fire powerful heat rays from his cybernetic eye, and project electricity from his body. Zor-El's cybernetic arm can shape shift into whatever he desires, limited only by the technology available to him at the given moment that he chooses to use this ability. Zor-El is virtually indestructible, and also has super-speed and super-strength. In the Legion of Super Heroes episode "Message in a Bottle", a Superman robot that resembles the Cyborg Superman appears as the property caretaker of the Fortress of Solitude in the 31st century. He is voiced by Yuri Lowenthal. David Harewood portrays Hank Henshaw in the 2015 Supergirl TV series. When discussing his character, Harewood stated, "Hank Henshaw ends up becoming Cyborg Superman in the comics, battling Superman. So I'm looking forward to that. He's a bit of a supervillain. He seems pretty indestructible. Which I kind of like because I keep getting blown up in these things. I'm kind of looking forward to being indestructible." Cyborg Superman debuted in the episode "The Darkest Place". Cyborg Superman is portrayed by Elijah Wood in the 2011 short film The Death and Return of Superman. In the 2016 film Lego DC Comics Super Heroes: Justice League – Cosmic Clash, Superman under the control of Brainiac shares a slight resemblance to Cyborg Superman. Hank Henshaw appears in the 2018 film The Death of Superman and its 2019 sequel Reign of the Supermen, voiced by Patrick Fabian as himself and Jerry O'Connell as Cyborg Superman. His story plays out like in the comics with the exception that his shuttle's destruction was caused by the meteor holding Doomsday with his crew killed instantly, his body being salvaged by Darkseid for his plan to tarnish the Justice League's reputation and execute another invasion. Hank Henshaw appears as a boss character in 2002's Superman: The Man of Steel. Cyborg Superman appears in Injustice: Gods Among Us, as a downloadable alternate skin for Superman. Hank Henshaw also appears in DC Universe Online in the ninth DLC, "War of the Light Part I". As a Hero, you fight him and Sinestro in "Assault & Battery", and again as a boss in "Mist Recovery". As a Villain, he assists the players in collecting Mist and fighting Kyle Rayner in "Mist Recovery". British wunderkind radio producer Dirk Maggs produced a Superman radio series for BBC Radio 5 in the 1990s. When the "Death of Superman" story arc happened in the comics, Maggs presented a very faithful, though much pared down, version of the tale which featured Stuart Milligan as Clark Kent/Superman, Lorelei King as Lois Lane, and William Hootkins as Lex Luthor. Versatile American actor Kerry Shale was cast both as the villainous Hank Henshaw and as Superboy. The story arc was packaged for sale on cassette and CD as Superman: Doomsday and Beyond in the UK and as Superman Lives! in the USA. In a comic book crossover starring Superman and the Fantastic Four, Reed Richards and his team are forced into an uneasy alliance with Hank Henshaw when the Marvel Universe's world-eating Galactus kidnaps Superman and transforms him into his herald. In conversation with Susan Richards, Henshaw points out the "ironic" similarity between his origin and the FF's. The story concludes with Galactus blasting Henshaw with a ray that turns him into a simple metal rod in response to his pleas for perfection, after the discovery that Henshaw was responsible for Superman coming to the Marvel Universe after he planted faked evidence that Galactus was involved in Krypton's destruction (having previously encountered the Silver Surfer in Green Lantern VS Silver Surfer, Henshaw had learned of Galactus and sought the enhanced power of becoming a herald). Hank Henshaw appeared in issue 19 of the Batman: The Brave and the Bold comics. Batman had to work with the Green Lantern Corps to keep Hank Henshaw from killing Hal Jordan. ^ "'Supergirl': David Harewood & Chyler Leigh Join CBS Pilot Cast". Variety. ^ "Supergirl's David Harewood Teases Becoming Cyborg Superma". comicbook.com. ^ Jayson, Jay (November 4, 2016). "Cyborg Superman is Coming To Supergirl!". ComicBook.com. ^ Narcisse, Evan (July 22, 2018). "The Death of Superman Movie Changes Up a Classic DC Comics Story Just Enough to Work". io9. Retrieved July 22, 2018. ^ "War of the Light Part 1". DC Universe Online. Archived from the original on 2 October 2016. Retrieved 2016-10-01.